On the face of it, commuter suburbs are a panacea for the ills of urban life. Professionals can find city jobs, enjoy easy access to a city’s culture, and network with millions of urban dwellers—while also getting the big house on a spacious lot in a quiet neighborhood, which might have better public schools and lower crime rates. You can have your cake and eat it too. This is a lifestyle that millions have opted into. Consider New York; the city proper, with 8.4 million people, is only 42 percent of the metropolitan area, with 20 million people. Likewise, Chicago is only 29 percent of its metro area, with 2.7 million in the city out of nearly 9.5 million people in the metro area. San Francisco is by far the most egregious. Only around 18 percent of the 4.7 million in the metropolitan area live in the city, which has a measly population of 850,000. This popular arrangement is bad for us all. The suburban rings rippling out from our cities cannot be reconciled with a participatory community. Commuter suburbs make for bad citizens and worse neighbors. The reason can be gleaned from that little suburbanite lie, which annoys actual city dwellers to no end. Recall the many times you’ve met someone who claimed to be from Chicago. Recall how often a follow-up or off-hand remark quickly revealed that said “Chicagoan” is not from Chicago at all, but rather from the suburbs. People who claim Chicago as their home without actually having a home in the city aren’t lying to mess with your head. (Except for people from Indianapolis who claim to be “from here,” and it takes everything in your power not to suffer a spontaneous aneurysm.) They’re not even saying it out of the fear you won’t recognize their humble village—though odds are, you won’t. 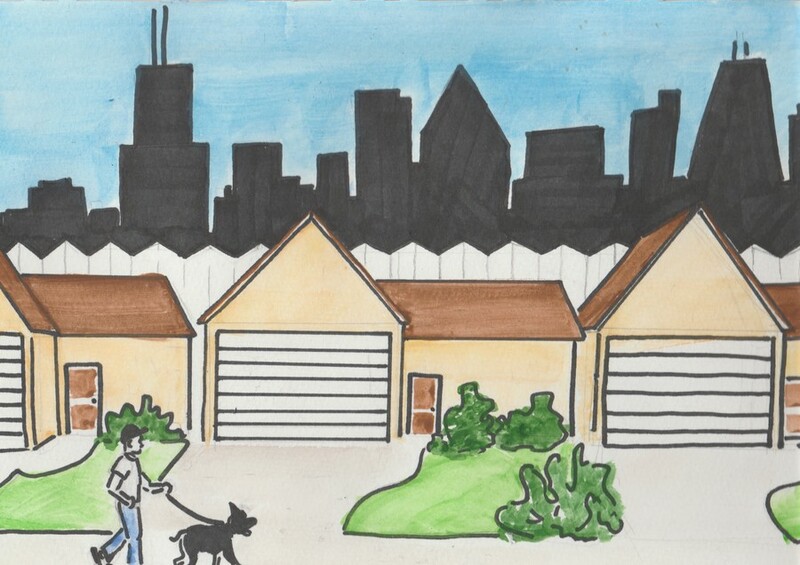 The reason suburbanites call themselves Chicagoans without batting an eye is that they really believe they are—and why shouldn’t they? Chicago is obviously the center of gravity in the region, and the satellite suburbs in its orbit often lack some quintessential features of a real community. You may like your town and consider it home, but nevertheless have a sense that the civic fabric holding the entire thing together is somehow impaired. Anyone from a commuter suburb understands intuitively the sense of dislocation you experience. If you’re from a Chicago suburb, you likely know a great deal about Chicago politics. At the very least, you can identify the mayor of Chicago and you have some rudimentary sense of the problems plaguing the city. But you probably don’t know the mayor of your town. That’s assuming you can even identify the structure of your local government. Plenty of suburbs have local political parties. Good luck finding someone who can name them, much less someone who can remember which one they voted for. The Chicagoland area is teeming with people who have strong opinions about elections they can’t vote in but who couldn’t care less about the local races actually on their ballot. That’s the real problem with commuter suburbs. We often have no desire to be a local citizen in the only place where we can be, and no power to be an active participant in the place we’d want. This runs hand-in-hand with a related trend in the U.S. civic scene: we form our associations based on ideological affinity and not geographic proximity. In doing so, we neglect other facets of civic life. You’re supposed to be a neighbor in your hometown. In commuter suburbs, that title is nothing more than a descriptive label for the guy in the house next to yours. Maybe you can name the people living next door. But you might not know anyone else on your block. In the stereotypical small town, that would be pretty shocking. But it may very well be the norm in the commuter suburb, where getting to know the people around you is anathema. And the people who take the next step and join community organizations? They’re the “crazies.” They’re those cliché parents in the PTA who want to ban video games and have yet to recover from the discovery that their teenager swears. When people don’t consider their hometowns to be worth their time, there’s no real appetite for community engagement. But while community involvement is “off-limits” to most, other forms of involvement abound in commuter suburbs. People join national political groups. They march. They form interest clubs. But that doesn’t make up for the community deficit. The associations preferred by suburbanites are almost never based on location. Instead, they’re based on shared values. We seek out organizations that reflect our ideals; consequently, we spend our free time associating almost exclusively with people who reflect those values too. That might be quixotic if it weren’t for the fact that it leaves us more deeply entrenched in our ideologies and unmoored from our hometowns. We may prefer to spend our spare time with those like ourselves, and we may find community engagement to be maddening, but we can’t have communities when no one is willing to participate. We certainly can’t keep our civic fabric intact when people’s knowledge of their suburbs barely extends beyond town names. For the millions of Americans who are mere observers in “their” cities and virtual strangers in their hometowns, civic involvement is too often abdicated, when it doesn’t have to be. That’s a dangerous trend. Natalie Denby is a second-year in the College majoring in public policy studies.